Police arrest, brutally assault, shove man onto road shouting ‘now you’ll learn how to talk to police’ as pregnant wife screams in alarm. It’s not enough that they evict them from their homes. 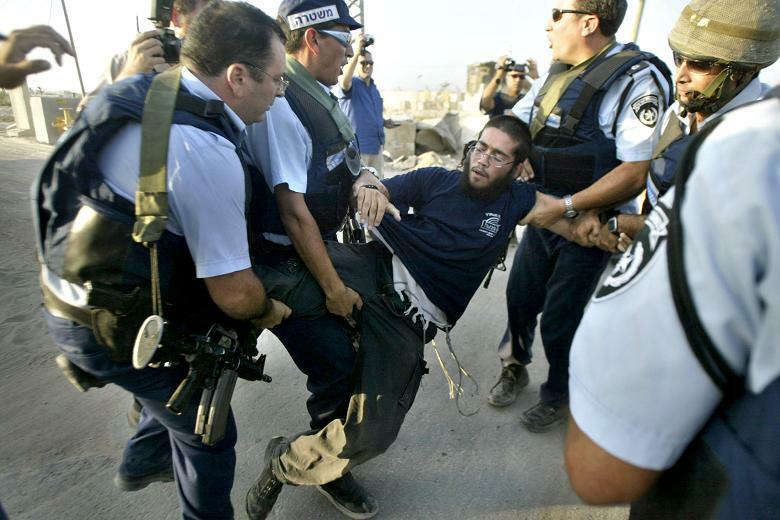 Three complaints were recently submitted to the Police Complaints Officer in the Samaria Judea (Shai) District against one policeman for violent arrest, unnecessary delays, and illegal vehicular searches, and improper body searches conducted on several young men. In the first incident, which took place on a Saturday night about a month ago, a man and his pregnant wife were traveling from Jerusalem to Samaria. At the Adam traffic circle on Route 60 just outside of northern Jerusalem, the policeman identified in the complaint stopped the vehicle and demanded that the husband produce an identity card. In the meantime, the policeman began a search on the person of a hitchhiker who was sitting behind him, at which moment the driver began documenting the policeman’s actions with his cell phone. In the video, the policeman can be heard demanding that he open the trunk himself, and after the driver refuses, the policeman tells him that he will conduct a body search of the driver as well. The driver asks to see the policeman’s card, but the officer refuses and tells the driver that he is being detained and then asks him if he refuses to submit to a body search. The driver replied that he refused a body search, at which moment the policeman informed the driver that he was under arrest, assaulted him, and shoved him onto the road with shouts of “you’re being disrespectful” and “now you’ll learn how to talk to the police”, as the driver’s pregnant wife began to scream and cry in alarm. The policeman then began a protracted search of the couple’s car, opening their bags, wallet, and trunk equipment. At the end of the search, the policeman put the driver into a police car and informed him he was being arrested for “interfering with a police operation”. When the driver requested to be released in light of his wife’s condition, the policeman responded: “Delete the video and I’ll let you go”. The driver refused, and only when his wife approached the policeman and asked to be released because of pains she’d begun to feel did the policeman acquiesce and release him. The complaint, filed by attorney Menashe Yado of the Honenu legal aid organization, asserted that “Without prior warning from the police officer, the policeman told the complainant, ‘Okay you’re under arrest,’ and charged the complainant with excessive brutality. In the second incident, which took place at the same traffic circle that evening, the policeman unlawfully detained two other couples while conducting a lengthy search of their personal belongings and equipment. In these incidents, too, the policeman’s actions were recorded on a cell phone, including his refusal to give those involved his name and reason for the search of their vehicle. A policewoman present performed a body search of one of the women while palpating her pregnant abdomen and even wanting to look under the woman’s blouse. In the third incident, which took place at Shilo junction, the same policeman arrived at the hitchhiking station where he met a young man and two boys, refused to identify himself and detained the three. During the examination, the policeman demanded that they search their body, and while examining one of the boys, he pulled on the boy’s pants and looked inside his underpants. The policeman then added that he wanted to search the underwear of the three men and threatened to detain them at the station should they refuse. The three refused, and after an additional search of their bodies and possessions, the policeman released them. Attorney Menashe Yado of Honenu who filed the complaints said that “the disgraceful and ugly behavior of a police officer who has been charged with excessive brutality against an innocent civilian without presenting a document and without explaining why, systematically targets people who have long peyot (side-locks), infringes on the rights of three families and a number of minors and humiliates those innocent civilians whom the police was supposed to serve.